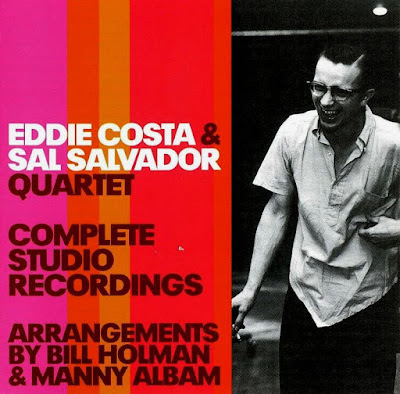 Eddie Costa: This is another set of recordings from an artist who died far too young, yet brought to the table a fine assortment of jazz concepts and musical ideas that had time allowed, we would have seen this young pianist and vibraphonist blossom into a character of renown standing and musicianship. With all of this material being laid down between 1954 and 1957, before his death on New York’s Westside Highway in the summer of 1962, we find him playing with the likes of Johnny Smith, Woody Herman, Bill Evans, and as a side man for far too many to mention, though including Tal Farlow, whom influenced him greatly. Many artists and jazz listeners initially did a double take when they heard Costa play, as he uncharacteristically emphasized the lower and middle registers, nearly ignoring the top two octaves … which may have had something to do with the nature of being partially self taught. Regardless, you’re going to be treated to an expansive set of sounds that span the jazz boards from swing to be bop to atmospheric renditions of restrained delight. Sal Salvador: Unlike Costa, Sal Salvador went on to become a musical Department Head at the University of Bridgeport. He was a brilliant guitarist, who like Eddie Costa, had a signature style that set him apart. With his single string style of playing, and the sound this produced, no doubt brought he and Costa together, where they were both far more together in the late 1950’s, than they were as solo artists. Though having said all this, Salvador was much more inclined toward experimentation and a comprehensive analysis of the guitar, its sound, and its presentation; leading him to write several books on guitar methodology that are still today considered a ‘must read’ by those who desire the nature of a classic musical education. The Compete Recordings: This collection of material leaves little to be desired, and I imagine that extensive time and consideration was put into creating a contextual flow to the songs found here … though I for one, wish that this ‘complete collection’ had been presented in order, tracking the development of these signature artists, being presented as a box set of sorts, rather than being presented as a compilation. Nevertheless, the sound is bright and clean, the tracking is stylish, and the essence of what these men were doing has been laid down and captured in what one might consider a concert presentation that ebbs and flows delightfully, featuring differing styles and productions that move in and out of each other gracefully.